A 30” diameter, 645-mile pipeline that carries light crude oil and liquid propane from Superior, Wis., through Michigan's Upper Peninsula and then splits into two 20-inch diameter parallel pipelines that cross just west of the Mackinac Bridge on the lake floor of the 4.6-mile long Straits of Mackinac (which connect Lake Michigan and Lake Huron). It then travels south through the Lower Peninsula, until slanting east from Bay City and crossing under the St. Clair River at Sarnia, Ont. where most of the oil goes to gasoline refineries. Some oil goes to the Marathon Refinery in Detroit and some is shipped overseas. How and when did Enbridge get the right to put in the pipeline across the lake floor of the Straits? The State of Michigan granted the request of Enbridge, a $125-billion Alberta, Canada-based oil transport company, for a right-of-way to build, lay and secure two pipes along the lake bottom in the Straits. The pipelines became operational in 1953. Today, they carry up to 23 million gallons daily of light crude oil and liquid natural gas (for propane). Michigan Attorney General Bill Schuette and others have said the right-of-way would not have been be granted if requested today. Are there benefits to Michigan of having Line 5? Enbridge says there are many. It says Line 5 supplies 65 percent of the propane used in the Upper Peninsula and 55 percent for the entire state and also says that 30 percent of the crude oil from Line 5 ends up at the Marathon refinery in Detroit to be turned into gasoline for Michigan motorists. Opponents say those numbers are exaggerated. “A very small amount goes to the Marathon refinery,” said Mike Shriberg,” regional executive director for the National Wildlife Federation’s Great Lakes Office in Ann Arbor. Enbridge also says that in 2016, it paid about $55 million in Michigan property taxes for using land its pipelines cross. Enbridge also pays for about $8 million in salaries to 103 employees in Michigan. What's the risk of a spill? Enbridge says the risk of a pipeline rupture is extremely small because the pipelines were built to the highest standards, the company goes above and beyond its regulatory requirements to monitor and upgrade the condition of the pipeline in the Straits and recent pressure tests proved the pipes withstood pressure many times higher than exists when oil is flowing. But critics say that even if the risk is small, the impact of a rupture could be catastrophic. They cite that the pipes were built more than 60 years ago and the strong and changing currents on the bottom of the Straits (the water flow through the Straits is 10 times that of Niagara Falls) put enormous stress on the pipes. Perhaps the biggest recent bombshell raising concerns about the Straits pipelines’ integrity came earlier this month when U.S. Sen. Gary Peters released a report that had been delivered to Enbridge in October 2016 as part of the company’s settlement with the federal government over its 2010 catastrophic spill into headwaters of the Kalamazoo River. The report noted that when the Straits pipelines were examined in 2003, bottom anchors to secure the pipes and required every 75’ by the right-of-way agreement with the state were missing in many places. Specifically, 16 locations had at least 140 foot spans unsupported by anchors. The longest was 224 feet on the west pipeline and 286 feet on the east pipeline. While Enbridge corrected the missing support problem and others identified since then, critics say it appears the unsupported spans could have existed for decades, putting damaging stress on the pipelines. Ed Timm, a retired Dow Chemical Co. engineer who authored a technical analysis of Line 5 for the National Wildlife Federation, told MLIVE.com that the neglect of the Straits pipelines between 1953 and 2003 has left them “one peak current event” away from failure. What is Enbridge’s track record on spills? Again, it depends on who is framing the response. Enbridge points out, correctly, that it has had no spills or leaks from the twin pipes that cross the Straits in their 64-year history. But a National Wildlife Federation researcher found that there have been 29 spills since 1968 of at least 1.13 million gallons of oil along Line 5, though none were in the Straits themselves. But the Enbridge pipe rupture that got Michigan regulators, politicians, activists and ordinary residents keenly focused on Line 5 took place in July 2010. That’s when a six-foot section of Enbridge Line 6B ruptured near a creek that drained to the Kalamazoo River in southwest Michigan. It was one of the worst freshwater inland oil spills ever in the U.S. Over four years of cleanup, more than 1.2 million gallons of crude oil was recovered and Enbridge has paid nearly $1.3 billion for cleanup and restoration. The Kalamazoo spill continued for 17 hours before Enbridge shut off the flow after a utility company employee noticed the pooling oil and notified authorities. Enbridge employees were alerted to a pressure loss by company monitors but initially dismissed the notification as a false alarm. Enbridge says pipeline shutoffs after a rupture are now automatic. 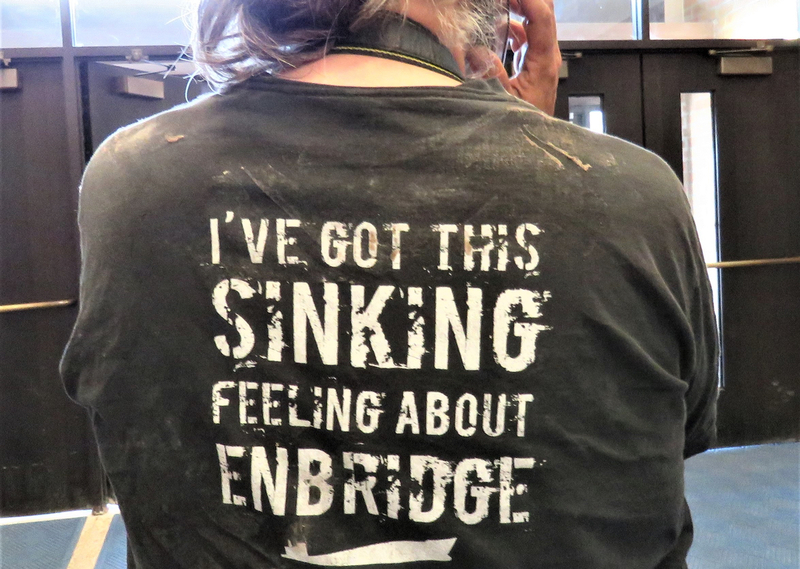 Asked whether Enbridge’s improvements are reassuring, Liz Kirkwood, executive director of For Love of Water, a Traverse City-based Great Lakes advocacy group, said Enbridge’s failure on Line 6B explains her skepticism about any company claim on safety. What would be the impact of a pipeline rupture in the Straits? That would depend on many things. A University of Michigan 2014 study funded by the National Wildlife Federation's Great Lakes Regional office found that in a worst-case scenario, more than 700 miles of Great Lakes shoreline could be significantly contaminated. The study noted currents in the Straits that unpredictably change direction and strong winds that can funnel into the area from various directions. Winter ice could make oil recovery difficult, if not impossible for work boats. Environmental damage to birds and fish also could be significant. And a heavily publicized, major spill could do long-term damage to areas where tourism is critical to the economy. Enbridge strongly challenged the U-M study, saying its new automatic shutoff system, the opening of a fully-staffed response office in St. Ignace and other improvements would minimize any damage in the unlikely event of a spill. On the one hand, it's in Enbridge's financial interest to prevent a catastrophic spill in the Straits with estimates of a potential cleanup running as high as $10 billion or more, depending on many factors. In its investigative report on the Line 6B Kalamazoo River spill, the National Transportation Safety Board cited “pervasive organizational failure” by Enbridge. Specifically, the NTSB said Enbridge was aware of a stress fracture in the six-foot section of pipe that ruptured and did nothing. It also noted inadequate training of the staff. What happened to the two reports the state commissioned from independent contractors on the risks and alternatives to using the Straits as a crossing for the Line 5 pipelines? The risk report was abruptly shelved last week when the state announced it had fired the contractor hired to produce the report after learning in late May that someone responsible for a key portion of the analysis also was working simultaneously on a separate report for Enbridge. Citing the contract’s conflict of interest clause, the state terminated the contract. No decision has been made yet on whether the state will now commission a risk-analysis report from another firm. Some estimated starting the process from scratch could set back a final decision on Line 5 for more than a year. Meanwhile, the state plans to proceed with its anticipated release this week of the second report, which examines alternatives to Line 5 for moving Enbridge light crude oil to refineries. Public hearings on that will be held in July (see details below). Among the anticipated options are using other pipelines routing around Lake Michigan, building a new pipeline through the Straits, building a new pipeline under the Straits bottomland, or building a new line through Ontario. How can I have a voice after the alternatives study is released? 6 p.m. Tuesday, July 25 at Little Bear East Arena in St. Ignace. It’s not clear and depends on what state officials decide on whether another risk study is needed. Eventually, perhaps by early 2018, it is expected that Gov. Rick Snyder or Attorney General Bill Schuette will determine a legal and political strategy to either shut down the Straits pipelines, or somehow force Enbridge to show greater accountability and transparency in its safety and testing procedures. Are there citizen efforts underway to curtail Line 5 transport of crude oil? A petition drive began in early May that would allow Enbridge to transport liquid natural gas products (but not oil) in the two pipelines across the Straits. Proponents must collect 252,523 valid signatures of registered voters by Dec. 1. If they do, the Legislature could vote to enact their petition as law. If the Legislature rejects the proposal, it would go on the Nov. 1, 2018 ballot. 12 years of borrowed time. Close down or start a clean-up fund of 100 Billion Dollars. I live on the north end of Burt Lake. Line 5 runs between Burt Lake and Mullet Lake, two 17,000 sq. acre lakes in Cheboygan and Emmet Counties. If Line 5 was to break here, the leak would destroy all of the properties on these two lakes. Mostly, the Straits of Mackinaw are highlighted when people think of the damage a break in Line 5 would cause. It goes far beyond that. Our whole economy would be destroyed by a break and closing Line 5 to oil is the only answer. Yes, you are absolutely right Jim, that the main focus is on the Straits of Mackinaw. But the entire line running through the UP and Lower Michigan and toward our Eastern borders is also at great risk. All pipelines needs to be stopped and certainly in our state of Michigan! That is why our next vote needs to be looked at carefully to ensure we vote in those politicians who will shut Line 5 completely down and remove it from our state. I spoke with a man who's family owns land that has Line 5 running through in Sagola, just east of Crystal Falls in the U.P. He said in the 1980's a lightening strike hit the line and blew all the top soil off, exposing an entire span of pipe about 10 feet long. He said when they looked at it, they noted all the protective layers had been blown off, exposing the bare metal. They called Enbridge and were told just to cover it up themselves. Enbridge officials never came to check on the condition of the pipe. So, they just covered it back up. One has to wonder how much rust has affected that section over all these decades. So much for their "Rapid Response Team" and protocol. Unfortunately, I don't think monopoly or quasi-monopoly companies are to be trusted in matters like this. Due to the dependence of consumers on their products (services) and lack of alternative suppliers and competition, they're in a position to ignore complaints. I called DTE several months ago to inspect and replace an obviously frayed (and potentially dangerous) drop line. Yes, they inspected it, and left, doing nothing. Over the long run, don't expect much more from Enbridge. They'll defer maintenance to maximize short term profits and CEO and CFO salaries and benefits. That's Enbridge's history. Why should things change? And you walk or ride your bike everywhere too? Without exhaling! Is this a silly or stupid comment regarding Enbridge? Enbridge is a corporation with perpetual life and limited liability. It is controlled by a board of directors and corporate officers. These people make millions, if not billions, of dollars a year in salaries, bonuses, and stock options. No matter what they decide to do or not to do with the pipe line, they will receive their salaries, bonuses, and stock options. Look back at the disasters caused by this corporations and others, you will find few to none of these people ever face jail time, fines, or loss of jobs. The common sense proposal to allow natural gas only and not crude oil to be carried through the pipeline was not mentioned until the very last few sentences of this article. It should have been the main point of the story and not buried at the bottom in the very last paragraph. As someone who used to live in Michigan I want to thank you for the informative article. What ever happens, it is clear that the issues are being well considered. Personally, I’m rooting for a safe pipeline. That would mean a tunnel, improved monitoring and robust clean up expertise. Maybe it also means a small fee on every barrel shipped going into a reserve fund. Sadly, I see the point of those terrified of a spill. Spills will happen. Michigan politicians and regulators need to be sure Enbridge pays for the cleanup and is threatened financially. 03/11/2019 Please update this “A cheat Sheet to the Enbridge Line 5 Controvery” as the whole last quarter of the story tells of meetings and hearings scheduled in 2017 - 2018. Where are we now! ?